Philadelphia International is among more than a dozen major U.S. airports vulnerable to sea level rise. 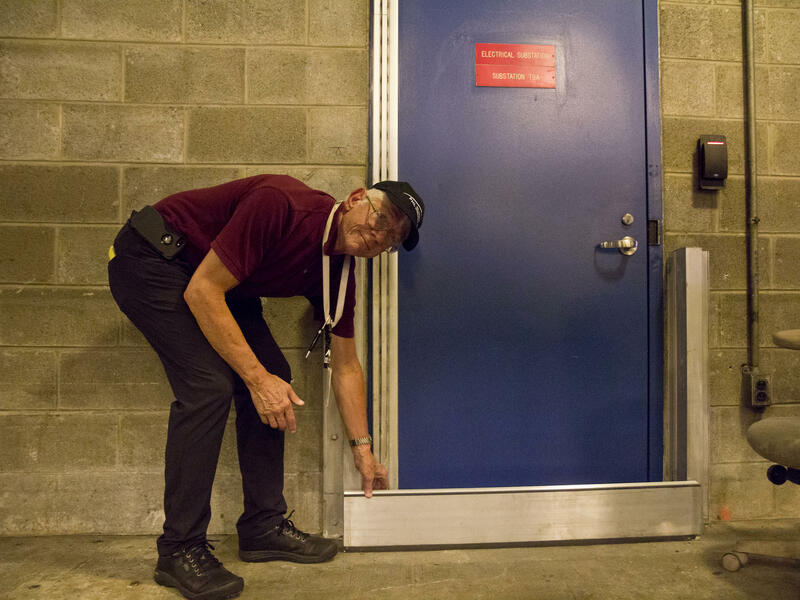 Raymond Scheinfeld, Philadelphia airport environmental manager, shows how sensitive electrical equipment can be protected from flooding. A federal report lists Philadelphia International as one of 13 major U.S. airports that have at least one runway within 12 feet of current sea levels. There are many more at risk around the world, and some have already faced flight disruptions or closure from storms and floods. Climate scientists, city planners and engineers say that will become more common as sea levels rise, storm surges and intense rain events worsen, and — in some areas — the land slowly sinks. Increasingly, it won't take a major tropical storm to shut down an airport. In 2012, Superstorm Sandy spilled more than 100 million gallons of seawater into New York City's LaGuardia Airport, shutting it down for three days. 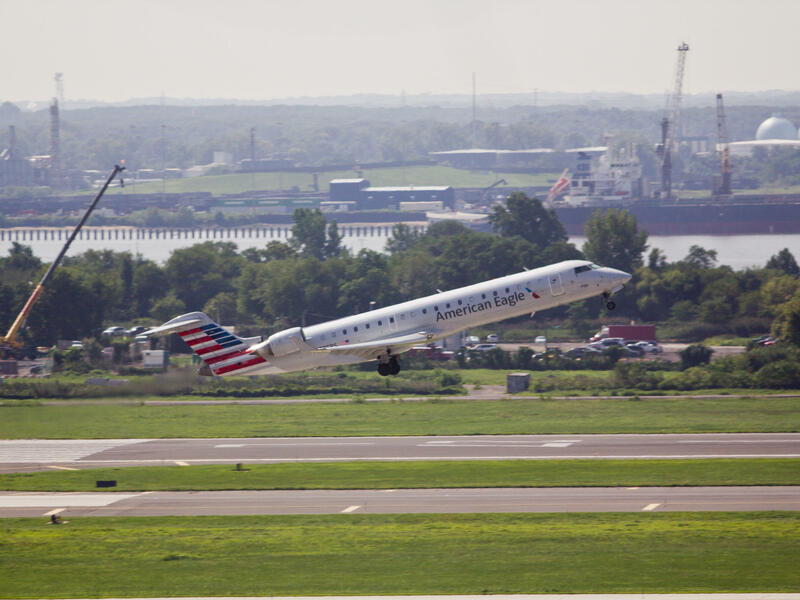 "If we got hit by that, we could have flooding on some of our taxiways or runways," says Ray Scheinfeld, who is in charge of preparing for rising sea levels at Philadelphia International. "We could have problems with some of our infrastructure." Scheinfeld says if an airport shuts down, that not only leaves passengers stranded but also prevents delivery of crucial items like medicine or emergency services. It could cost millions of dollars in revenue for the region. Adding to the risk in Philadelphia, some of the most critical infrastructure is 15 feet underground. In 2013, a storm flooded a tunnel serving one terminal with 3 feet of water, shutting down baggage conveyor belts and inundating an electric substation. It knocked out all power and resulted in about 12 canceled flights. After that, the airport installed stackable aluminum barriers that seal the doors to the substation. "If we know a storm is coming or there's a potential problem, we can insert those," says Scheinfeld, "and protect probably up to about 40 inches above the floor level." Scheinfeld says new facilities built at the airport will also accommodate future sea level rise. "We may put additional fill into a particular area," he says. Boston's Logan airport has raised its electrical equipment and purchased new flood barriers. San Francisco's airport has runways that jut out into the bay. It has already installed concrete berms and walls and is working with the Army Corps of Engineers to do more. Rob Freudenberg has studied climate impacts on New York area airports for the Regional Plan Association. He says solutions don't come easy or cheap. "If you're talking about airports on the edge of the sea, the most likely thing you would think to do is build a higher wall around that airport," he says. "But there is a point at which you can't build a wall so high that an airplane couldn't clear it. So this is a tricky thing with airports." Freudenberg says the problem will only get worse as the planet continues to warm and seas keep rising. In a few decades, he expects some airports may even be underwater and in need of a new home. Coastal flooding isn't the only climate-related problem for airports. Extreme heat has grounded planes in Phoenix. Melinda Pagliarello, of the Airports Council International-North America, also cites higher temperatures that lead to reduced snowfall. "When an airport that used to get x number of feet of snow, but now is getting the equivalent in rain," she says, "that is in some cases overwhelming or challenging the existing drainage system." And all that increased wetness can have another impact, this one somewhat icky. "Worms are infesting the runways," Pagliarello says, making them slippery. This story comes to us from StateImpact Pennsylvania, a public media collaboration covering Pennsylvania's energy economy. Some major U.S. airports are at risk. They're built on low lying land on waterways near the rising oceans. Here's Susan Phillips of our member station WHYY and NPR's energy and environment team. RAY SCHEINFELD: Here we go. Let's go in quick. SUSAN PHILLIPS, BYLINE: Climbing 120 feet above the runway in the ramp tower of Philadelphia International Airport, you can see it's surrounded by water - wetlands, creeks and the Delaware River just a couple hundred yards away. Ray Scheinfeld is in charge of planning for rising sea levels at the airport. And he pulls out an old map of the area. SCHEINFELD: OK. This is from 1777. And at that time, you can see, some of the drainages that went on out here. PHILLIPS: Like a lot of airports, Philadelphia's was built on marshy swamp and landfill. Scheinfeld says the idea was to find large tracts of land near cities but far from tall buildings. But now these airports are increasingly threatened. In 2012, Superstorm Sandy spilled more than 100 million gallons of seawater into New York City's LaGuardia Airport, shutting it down for three days. SCHEINFELD: If we got hit by that, there would be an event where we could have flooding of some of our taxiways or runways. We could have problems with some of our infrastructure. PHILLIPS: Scheinfeld says that not only leaves passengers stranded but also prevents delivery of crucial items, like medicine or emergency services. It could cost millions of dollars in revenue for the region. PHILLIPS: Here in Philadelphia, some of the most critical infrastructure is 15 feet underground. SCHEINFELD: So now we're about to enter into the tunnels. And you can see how much we dropped down. PHILLIPS: In 2013, a storm flooded this tunnel with 3 feet of water. It knocked out all the power in the terminal, shutting down the baggage conveyor belts. Scheinfeld says the airport now has stackable aluminum barriers that can seal the doors and protect the power. SCHEINFELD: And if we know a storm is coming, before there is a potential problem, we can insert those in here and protect probably up to about 40 inches above the floor level, keeping water from getting into the substations. PHILLIPS: In Boston, Logan Airport has raised its electrical equipment and purchased new flood barriers. San Francisco's airport has runways that jut out into the bay. It's already installed concrete berms and walls and is working with the Army Corps of Engineers to do more. In addition to sea level rise, changes in rainfall are also causing problems. Melinda Pagliarello is with the Airports Council International. MELINDA PAGLIARELLO: An airport that used to get X number feet of snow but now it's getting the equivalent in rain that is, in some cases, overwhelming or challenging the existing drainage system. PHILLIPS: Rob Freudenberg has studied climate impacts on New York area airports for the Regional Plan Association. He says solutions don't come easy or cheap. ROB FREUDENBERG: If you're talking about airports on the edge of the sea, the most likely thing you would think to do is build a higher wall around that airport. But there is a point at which you can't build a wall so high that an airplane couldn't clear it. So this is a tricky thing with airports. PHILLIPS: Freudenberg says the problem will only get worse as the planet continues to warm. In just a few decades, he expects some airports may even be underwater and will need to find a new home. For NPR News, I'm Susan Phillips in Philadelphia. (SOUNDBITE OF RUDEMANNERS' "FALSE") Transcript provided by NPR, Copyright NPR.